Vitality symbolises a zest for life and is said to be the ideal gift for people about to embark on a new project who need that extra burst of energy coupled with a certain amount of good fortune. The bookmark can be hung over the spine of a book or diary as a constant reminder of your wishes. 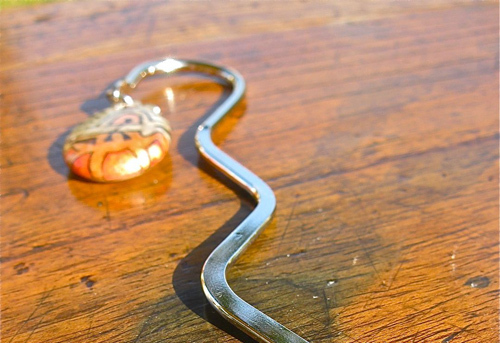 The Vitality Indalo figure is hand-painted onto a Spanish calciridite pebble in coral, bronze and silver and this is then hung onto the squiggly bookmark with a silver-plated ring. Send this Vitality lucky charm bookmark to a loved-one or friend to help fill their life with inspiration - and the energy to succeed. Comes gift-wrapped, like all our presents - and we can print a personal message on your behalf.